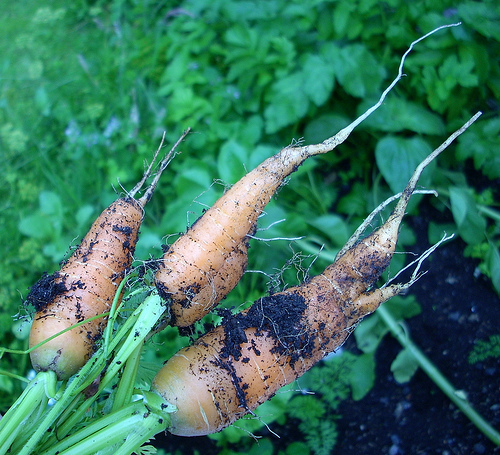 free food - Frugal Living in the UK Free food, foraging and gardening. Freshly picked, organic foods will add a large amount of goodness to your diet for a minimum of cost or sometimes even no cost at all! Many wild plants are edible and extremely good for you. Young dandelion leaves are excellent in salads,very rich in nutrients and good for detoxifying as are young beech leaves. Dandelions make excellent pancakes (see our recipe). Nettles (yes, do wear gloves when picking! They don’t sting once cooked) are a traditional remedy for people who are run down and have a near perfect balance of iron, vitimin C, calcium and magnesium. See our soup recipe. Wild garlic grows in woodland and is harvestable in April/May – see our pesto recipe using it. Chickweed is a bit like spinach when lightly boiled. During the summer you can find wild raspberries growing in woods. In autumn blackberries/brambles are to be found. With all wild foods, don’t gather them by busy roads where they will have been polluted and check thouroughly for signs of insects! Not completely free but if you have the space, time and energy you can save quite a bit. The most economical plants are perrenials – those which come up every year. You buy them once and then have harvests for years to come. If you like summer fruits the price in the shops is very high – £20 will buy you a few red/black/white currant or raspberry or gooseberry bushes which will give you fruit each summer. Strawberry plants are even cheaper and multiply each year – if you know someone who grows them you could ask for some of their new plants. If you like to use herbs in cooking, teas or as remedies it’s well worth investing in a few plants. Lovage comes up each year and provides large quantities of celery flavoured leaves which are great in soups and casseroles. Likewise sage, thyme, parsley (a bienniel – lasts two years), fennel, mint, lavender, chives and valerian are all quite hardy and should give you many years of flavour and scent. A little veggie plot can save lots too – a packet of lettuce or cabbage seeds for under a pound should give you at least 20 plants. ‘Cut and come again’ or ‘salad bowl’ lettuce varieties are great as they keep growing as you cut the leaves you want so last much longer. Kale is a marvelous vegetable – it continues growing, albeit slowly, through winter and provides green leaves to be chopped into soups for at least two years. Peas are very easy to grow and seem to survive well even in amongst lots of weeds! Everyone loves them straight out of the pod. SimplySeed prices are typically 50% less than the High st. and they offer low or free delivery too. You can also search for the seeds you want on Amazon and compare sellers/prices. If you buy several packs from the same person or business they will usually reduce your postage on request. Many flowers are edible – nastursiums have a peppery sweet taste – both the leaves and flowers are edible. Marigold petals are a colourful addition to a salad. Either buy heirloom seeds or wait until the end of the season and you can pick up seeds for from 10p a packet at Wilko’s that are still viable for the following year. You can also buy fruit bushes in Poundland such as Raspberries, Redcurrants, Goosberries, Blackcurrants and Blackberries. Pingback: Super Cheap Pots, Herbs & Gardening!